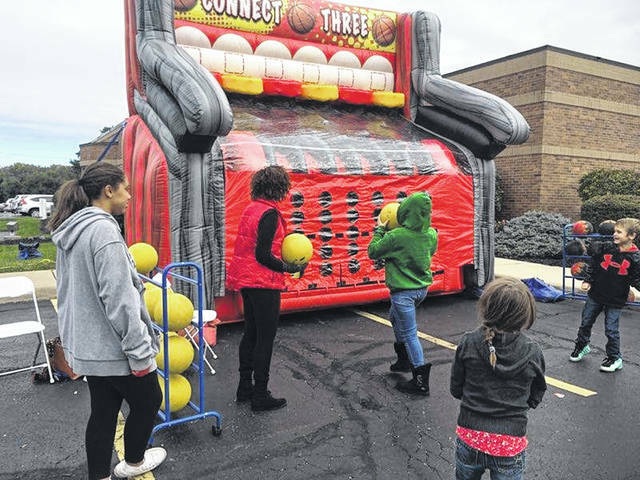 From left, Urbana FFA students Kendra Baccus and Kaylin Lance help run the connect three basketball game on Oct. 14 at Urbana Mercy Health’s family fall festival. Students aided in face painting, blowing up balloons for families, as well as a yard-sized game of Connect Four. Students were also asked to help supervise bounce houses and pumpkin decorating for families. Mercy Health provided surgical robots that students and families could test-drive. Other activities included touch-a-truck and raffles.